I'm a person just like everyone else," says heavy metal legend Ronnie James Dio, almost shyly. With more than three decades in the music industry - and a resume that includes influential stints with Elf, Rainbow, Black Sabbath and the eponymous Dio - he has, in fact, earned the right to be called a legend. But he seems a little uncomfortable with the tag. "Perhaps I sing better and write better than a lot of people," Dio says, in a recent phone interview, "but I can't fix my television. I can't fix my car. I can't fix my plumbing. Does that make me better than the guy that can do all of those things? Absolutely not." 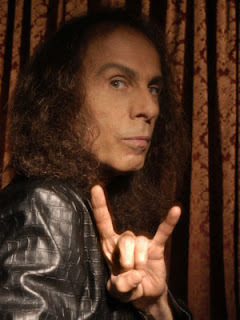 Still, he's Ronnie James Dio. So he's honored by the adulation - but he isn't about to stand pat. "If people consider me to be a legend, I think that's wonderful - and I thank them all for it," he said. "But any time you start believing the people who call you a legend, your career suffers. You have a tendency to rest on those laurels, and that's something I never want to do." Dio fronted Elf, then left for Richie Blackmore's band, then left for Black Sabbath, then left for a wildly successful early solo career - all within the span of the decade between 1974-1984. He's not done, either: Dio's latest album "Killing the Dragon" was released in May, and he's also embarked on a summer tour with a pair of other legendary bands, Deep Purple and the Scorpions. Call this new tour a family affair: Deep Purple bassist Roger Glover produced the first album by Elf. Blackmore was a member of Deep Purple before forming Rainbow with Dio. Deep Purple singer Ian Gillan replaced Dio when he left Black Sabbath in 1982. "They're all dear friends," says Dio, who toured with the Scorpions years ago, too. "It will be wonderful. It's like being out on the road with family." Dio will be touring in support of an album that's closer to the sound fans expect from him. After an experimental period, Dio's last two albums have been a return to his metal-pioneer roots. "Magica," released in 2000, was a concept album, which Dio says served to reintroduce fans to the his penchant for fantasy-based songs. The CD also marked an instrumental homecoming for former Dio guitarist Craig Goldy and for bassist Jimmy Bain, who had been in Dio and Rainbow. "We had done some things before 'Magica' that I think were very confusing to people who grew up as Dio fans," he says. "It was necessary for me to do an album that made people say: `That's got to be Dio. Only he can do an album like that.'" While Dio, and fans in general, were happy with that album, he wanted his latest to be a contrast to the epic scope of "Magica." "I didn't want 'Killing the Dragon' to be another conceptual piece," says Dio, born Ronald James Pardovana in 1949. "It's an album driven by songs, not story or concept. It seems to have worked pretty well. I think this is the album most people expected." He regards "Killing the Dragon," as a classic Dio album - in the tradition of "Holy Diver" and "Last in Line," two fan favorites. In fact, 1983's "Holy Diver" seems to be the benchmark for Dio - the album fans always compare his latest work with. He says that's been frustrating on occasion, but he's happy that the first Dio album has so much resonance. "It's nice to have that piece of music as a standard, something you have to strive to reach. I think that makes you better," he says. On "Killing the Dragon," Dio has mingled a few fantasy-themed songs with others that take a look at issues of the real world. One stands out: "Throw Away the Children," originally planned as a benefit song for one of Dio's favorite charities, Children of the Night. The singer has worked with the organization, whose goal is to rescue runaway teens from prostitution, for many years. But when the song was finished, Children of the Night decided they wanted something more uplifting. "There are two ways you can deal with these things," Dio says. "You can put pictures of starving children on the television … or you can be positive and say `we're going to overcome this.' My way was to smack people in the face with the despair and depression of it all." The lyrics of the song are dark and reflect Dio's own experiences working with the charity. He says the lyrics may be disturbing, but the reality is even moreso. "I know all of these kids very well, and I've seen a lot them die from HIV(-related illnesses) at 16 years old," he says. "Throw Away the Children" wasn't Dio's first encounter with charity work. Back in the 1980s, when some of the biggest pop stars got together to record "We Are the World," a lot of hard rockers wanted to help as well, but weren't invited to participate. In response, Dio helped organize "Hear 'n' Aid," a heavy metal benefit album. That album, now out of print, will be repackaged with a new "Hear 'n' Aid" project to benefit Children of the Night in the near future. All of this charity work might seem out of character for someone with Dio's reputation. He has often been associated with darker impulses - beginning perhaps with 1980's "Heaven and Hell." It's no matter to Dio. "I know what I am, and I've always known what I am," he says. "I think the reputation started with Black Sabbath. Here's this band that was purportedly the most evil thing on the face of the Earth - and it was mainly because of the name. I know just how un-evil those guys actually are." Fans of the television show featuring his Black Sabbath predecessor Ozzy Osbourne probably agree. Dio, for his part, liked the rest of the band enough to rejoin them a decade later for 1992's "Dehumanizer." A lot of the criticism, Dio says, may stem from the fact that he's never defended himself. He'd rather let people draw their own conclusions. "Instead of defending themselves, (Black Sabbath) didn't say anything about it," he says. "They just let people listen to the music and make their own judgments. That's what I try to do." Dio says that anyone who finds evil in his music is obviously looking at it the wrong way. In fact, he points to lyrics from "Heaven and Hell:" "The devil is never a maker/the less that you give, you're a taker." "I think anyone who listens to my songs or Sabbath's songs realizes that they were songs telling you to beware of evil," he says. "We were not saying `here comes the devil, he's a great guy.' It's exactly the opposite." For fans who like the fantasy side of Dio's music, there's another treat on the way in the future. He planned the "Magica" concept as a trilogy, and he hopes to put out the next two installments as a double CD. He also hints that there might be a novelization of the concept in the works. "That's something I'd planned to do, but unfortunately time is a consideration," he says. "It takes a long time to plan and write a book, maybe a year or more. If I ever have that year, I'm planning on doing it." Dio is also working on an autobiography, one that is partially finished. He'd like to get the writing projects done before he retires, because he says, "when I retire, that will be it for me." For now, however, the concept of quitting seems foreign. "I wouldn't know what (retirement) is; I've never even taken a vacation, because I feel too guilty about it," Dio says. "I think people will let me know when it's time to retire, and I'll know when my talent's diminished. But I don't see that in my future at all." Things are simpler now for Dio, who fronted one the of the early 1980s' more dramatic heavy metal acts - complete with explosions, giant dragons and lasers. "I'm doing what I love," he says, "and that's the greatest gift I've ever gotten." Review: Danzig, "777: I Luciferi"